Sawmill Herb Farm is wholeheartedly committed to sustainable land-stewardship and providing top quality organically grown healing plants to the local community. Through our educational programs and partnerships we aim to strengthen community awareness of medicinal herbs as a component of holistic health and bring the deep wisdom of nature connection into the community one seed at a time. 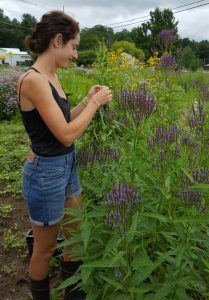 Our small herb farm is nestled in the Pioneer Valley of Western Massachusetts, where we offer a fresh herb CSA providing a diverse array of medicinal and culinary herbs throughout the growing season. Year-round we offer tea blends, bulk dried herbs, culinary herb and spice blends, and a line of herbal extracts and body products. The land that we reside on has been farmed continuously since Northampton’s founding and has grown a diversity of crops over the years. Read more about some of the rich history of this land here and of Florence at the David Ruggles Center. Susan Pincus is the owner of Sawmill Herb Farm and is passionate about creating a perennial system for growing high quality medicinal herbs. You’ll find her out in the fields with the interns or foraging in the woods and meadows for edible and medicinal plants. Hear us on the River with Monte and with Phil Korman of CISA. Download and listen to this interview we had on Valley Free Radio’s Farm to Fork program about the farm and GFN. Thank you to Leslie Lynn Lucio for this great article about Sawmill Farm in the Pioneer Valley Edible Magazine. Grow Food Northampton is a non profit devoted to furthering local agriculture and food security in the Northampton area. They are currently leasing us 3.5 acres of land next to their community garden plots in Florence, MA. We are thrilled to be partnering with an organization that is as passionate about organic local food as we are. They continue to be an amazing support system as we establish and develop our business. Check them out on Facebook, or at their website www.growfoodnorthampton.com.